Do you want to improve your impact with investors? We can help you to polish your fundraising, prepare portfolio management teams for exit and get the best out of your investor days. Download this short guide to find out what we do at each stage of the process and how we can help you overcome your challenges with investors. You want only excellent communication skills training firms. You need someone who makes your life easier. That means choosing the best. Download this short overview of our leadership communications, public speaking skills and presentation training courses and see if we fit your demanding standards. You need your clients to look impressive. But sometimes, their communication skills require some polishing. To do this you want someone experienced at working with CEOs and CFOs. 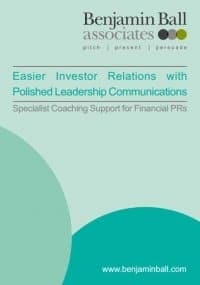 Download this short overview of our support for PR and Financial PR firms to see if we might be able to help you. For hedge funds wanting to improve their investor pitches. If you want to review your current investor pitch, improve how you prepare for investor presentations and rehearse your team for investor meetings. Download this short guide to see if we may be able to help you. When you want to win a pitch confidently. Learn how we can help you win more pitches, and improve how your team handles sales presentations. 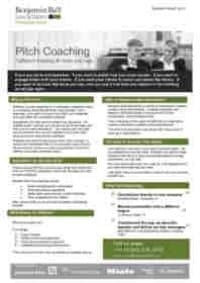 Download now to help you prepare your pitches, create more compelling pitch materials and make sure you get the results you want. Before any investor presentation, use this checklist to see if you are ready. 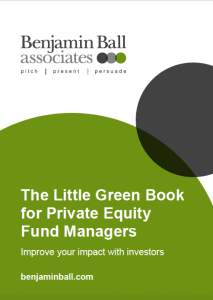 Based on our 12 years experience of supporting fund raising and asset managers, this quick checklist will help you prepare for any investor pitch or presentation. 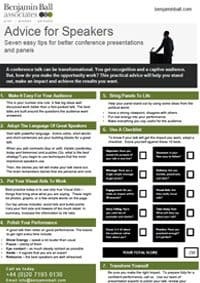 Do you want to get the most from your next conference talk? Would you like to give a talk that gets noticed, and makes you feel confident? This advice will help you make every conference appearance valuable. 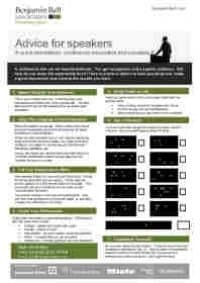 Here you will find some of the top advice our expert trainers give to senior executives from around the world to help them deliver confident compelling talks in English. You have an important talk to deliver. Learn how to create and deliver a great talk. Feel confident and know how to deliver it brilliantly. 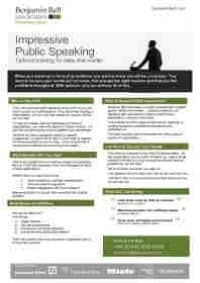 Download this overview of our public speaking skills courses so you get the results you want. A conference talk can be transformational. You get recognition and a captive audience. But, how do you make the opportunity work? This practical advice will help you stand out, make an impact and achieve the results you want. Presentations and talks in English can be daunting. Not only do you have all the challenges of giving a great talk, but also you have to cope with the language. When you are pitching to investors, you only have a few moments to connect. Investors will make an initial judgement within seconds. How can you be sure your story, your materials and your performance are confident, compelling and persuasive throughout? That’s when you need us.